Invisibly records all keystrokes such as username/password, emails/documents and other online activities etc. 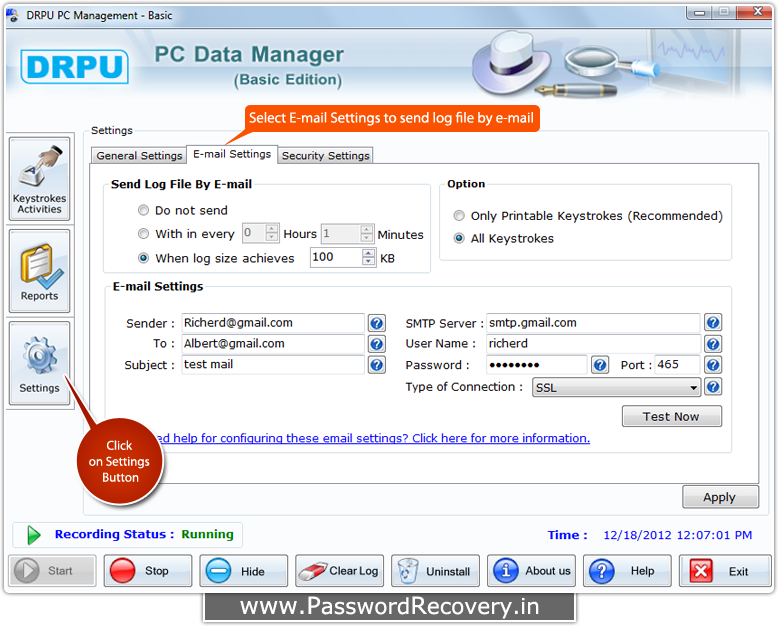 Record all user keyboard activities in secure log files, which can be sent to specified e-mail address. Record and view login time and date of every session created. Display login session detail and total keys pressed in the current session. 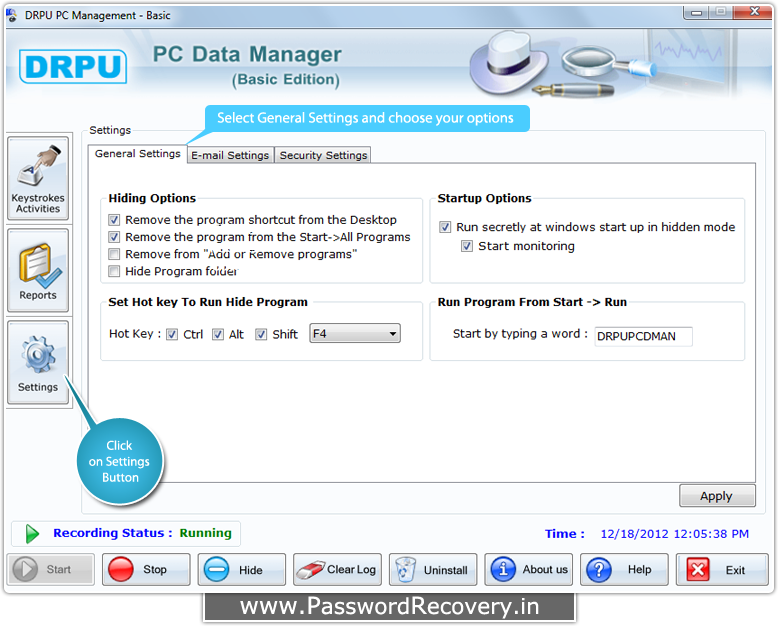 Easily record multiple user PC activities. Display the title Windows in which the keystrokes occur. Software runs invisibly in the background. Software easily overrides all major anti-virus software. 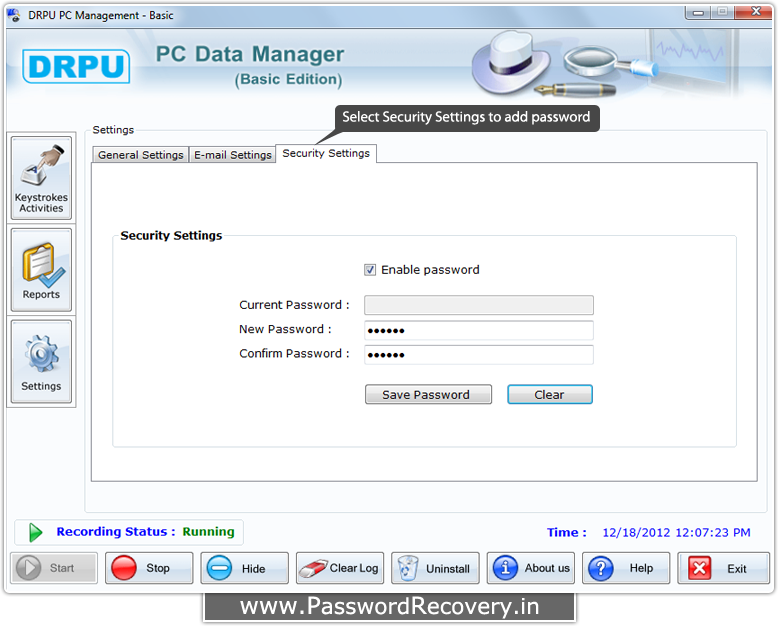 Key logger is password protected application that prevents unauthorized users from changing or modifying the software configuration settings. Useful tool for secretly monitoring Keyboard activities of your children, family or employees to check what they are doing on PC in your absence. Show recording status on the Software window. Easily search and navigate through logs for various dates. Graphical user interface allows you to familiarize with the software features. View all types of keystrokes activities that are performed on your system by clicking on 'Keystroke Activities' button from the left panel. How to Capture keystroke activities? Generate report of keystroke either in .html or .txt format by selecting date range and select an option to view report having 'Only Printable Keystrokes' or 'All Keystrokes' like [space], [backspace], [enter] etc. Click on 'Settings' button from left panel to change setting of the keylogger. In 'General Settings' you can change the Hiding Options, Startup Options and Set Hot key to Run Hide Program. In 'E-mail Settings', select an option to 'Send Log File by Email' (in above screenshot, log file will be send when log size reaches to 100KB, then it will maintain another one to send). In 'Security Settings', you can add password. In that case, software will require password before running.